Contact person: Dr. Mats Mogren, phone: +46 (0)46 222 4945. Mats Mogren worked as an archaeologist for the Swedish National Heritage Board(Riksantikvarieämbetet) since the late 1970s. During the years 1988–1995, he worked as Swedish coordinator and consultant for a educational and research project on prehistoric and protohistoric settlement archaeology in the central part of Sri Lanka, a project funded by the Swedish International Development Cooperation Agency, Sida. Mogren has published several books and articles on the findings from the project, often together with Prof. S.D. Bandaranayake from the the Postgraduate Institute of Archaeology (PGIAR) – an independent academic institution established in 1985, connected to the University of Kelaniya in Sri Lanka, to provide opportunities for enhancement; and uplifting of the knowledge on Archaeology and related fields. Among the books could be mentioned ”Studies in the settlement archaeology of the Sigriya-Dambula region”, published in 1990, and “Further Studies in the Settlement Archaeology of the Sigiriya-Dambulla Region” published in 1994 (edited with Senake Bandaranayake). From 2005 till April 2012, he was affiliated as a research assistant to the Dept. of Archaeology and Ancient History in Lund. In May 2012, he started to work at the County Administrative Board of Skåne (Länsstyrelsen i Skåne) in charge of its unit for Archaeology and ancient monuments, but still keeps on with his Sri Lanka research. It focuses on historical archaeology in a global perspective, with a special interest for Sri Lanka, and in particular cultural contacts during the colonial period (16th–20th centuries), processes of hybridism and creole cultures. It also includes the eological footprints of this epoch – changes in the landscape as a result of the establishment of world systems. Mats Mogren has well established contacts with the relevant institutions in the Archaeology departments at Kelaniya University, and the Department of Archaeology, Postgraduate Institute of Archaeology, Peradeniya University. He is also chair of the Publications committee of the newly founded Centre for Asian Studies at Kelaniya. Dr. Mogren gives lectures at these during every visit to the country. In recent years, Dr. Mogren has worked on two Sri Lanka related research projects. The first is titled “Imprints of the colonial encounter. Forms of hybridity in the material culture of Sri Lanka“, focusing on the architecture of settlements during the colonial period. The second project is part of a major project Historical-Political Ecology as a Framework for Assessing Visions of Sustainable Development. The project initially involved field studies in six regions of the world (Peru, Venezuela, Kenya/Tanzania, Madagaskar, Taiwan and Sri Lanka); as a result of the project’s development, the field studies in Madagascar and Venezuela have terminated. In November 2007, the Swedish Research Council for Environment, Agricultural Sciences and Spatial Planning (Formas) decided to fund this interdisciplinary project titled ”Power, Land and Materiality: Global Studies in Historical-Political Ecology as a Framework for Assessing Policies for ‘Sustainable Development’”, coordinated by Prof. Alf Hornborg. The project is carried out in collaboration between 10 researchers from the departments of Human Ecology in Lund and Göteborg, the departments of Human Geography in Lund and Stockholm, the Dept. of Agrarian History at the Swedish University of Agricultural Sciences (SLU) in Uppsala, and the Dept. of Economic History in Stockholm. Sub-studies will be made in several countries. In South Asia, Mats Mogren will do a study in Sri Lanka, on ”Plantation Colonialism and the Change of Landscape in Sri Lanka. A historical-archaeological case study”. More information about the Formas project grant. Main project abstract: The project will consolidate a coherent, trans-disciplinary theoretical and methodological framework for studying processes of long-term environmental change. Building on previous research as well as six case studies in South America, Africa and Asia, it will bring together a network of Swedish expertise on the subject as the core of a national “think-tank” engaged in empirical studies of long-term sustainability from different parts of the world, and in refining a common theoretical framework. The consolidation and elaboration of this theoretical framework – tentatively called “global historical-political ecology” – is thus an important aim of the project, but can only be conducted through continuous interaction and engagement with the empirical case studies. The central analytical perspectives to be developed emphasize that landscapes must be understood as the cumulative material imprints of historically successive patterns of land use reflecting shifting regional and global relations of economic and political power. 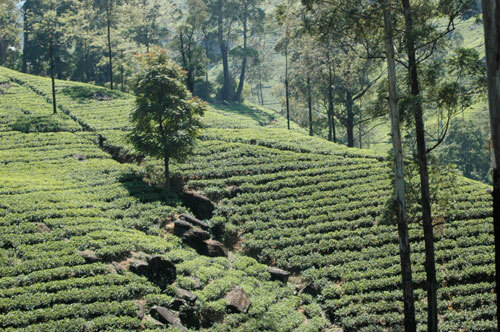 Sri Lanka project abstract: The historical-archaeological case study/sub-project concerns the cultural landscape that was eclipsed by large-scale plantation agriculture in Sri Lanka during the colonial period. It will consist of a survey of literature and historical maps, palynological investigations in chosen sites, interviews and documentation of oral history, a study of plantation-related transport systems and collecting socio-medical and demographic information from the plantation areas. Collaborative links have been established with three different universities in Sri Lanka (Kelaniya, Peradeniya and Sri Jayewardanapura) for this sub-project. On Thursday 20 September 2012, Mats Mogren held a SASNET Brown Bag lunch seminar entitled ”Inbetween Rain Forest and Plantation. 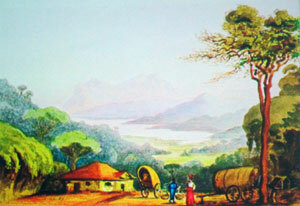 Understanding Colonial Changes of Nature in Sri Lanka”. The presentation was based on his research projects that aim at a better understanding of the development of the cultural landscape of the Wet Zone of Sri Lanka (the southwestern quarter of the island that receives the rain from two monsoons). Dr. Mogren has been working with palynological methods in a number of sites in various geographical sub-regions of the wet zone, littroral, lowland interior and montane, as well as in different plantation crop areas, cinnamon, coffee/tea, rubber, coconut. Coring in wetlands has revealed a complex landscape history which will be used to question the taken-for-granted narrative of the first Scottish/English planters that plantations were established after clearing away virgin forests. Mats Mogren also plans for a future project, an attempt to evaluate the possibilities for a battlefield archaeology in Sri Lanka. Several battlefields from 16th-early 19th C. are known and a rich oral tradition exists.